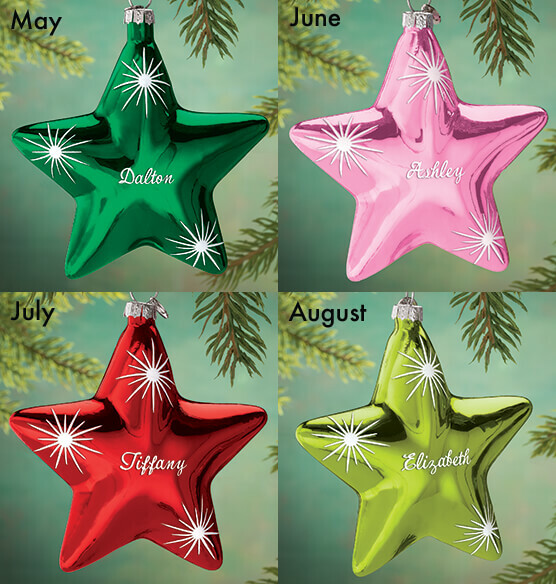 Starring on your Christmas tree, this personalized Birthstone Star ornament shines in your choice of 12 birthstone colors—each artfully personalized for a keepsake gift. Detailed with elegant, flocked snowflakes, all 12 jewel tones shimmer in heirloom style, creating a can’t miss, custom gift for anyone on your list. Specify month. Specify name; limit 1 line 8 letters/spaces. Personalized Christmas ornament measures 4" long x 4" high. Ornament colors are very bright and names engraved nicely. Names are very easy to read. Happy with product. I'm usually very happy with my order, not this time. Your packaging was not good. I ordered 6 breakable ornaments along with 3 other items. It was shipped in a large box with no packing in box to protect the ornaments. They were bounced around and I did have breakage. That's not good, now I'll have to return items just because of bad packing in shippment. Stars are larger than I imagined. Everyone will feel special. Star ornament for my 2 yr old granddaughter, who is a star in my eyes. Just perfect size for the tree. I do like the longer area for a name as I have someone that goes by two names and the spacing was more on this ornament than others. I got these for my Grandkids. They love there ornaments & the fact there names are on it :) I am not crazy on how they wrote the letter E it looks like an L but I know everyone writes differently :) I will be buying some more again. Purchased for my Grandkids tree to remember Grandma. I past out the ornaments yesterday on Thanksgiving so my family could put them on their trees. They were a hit. Everyone enjoyed them very much. Thank you they are beautiful. 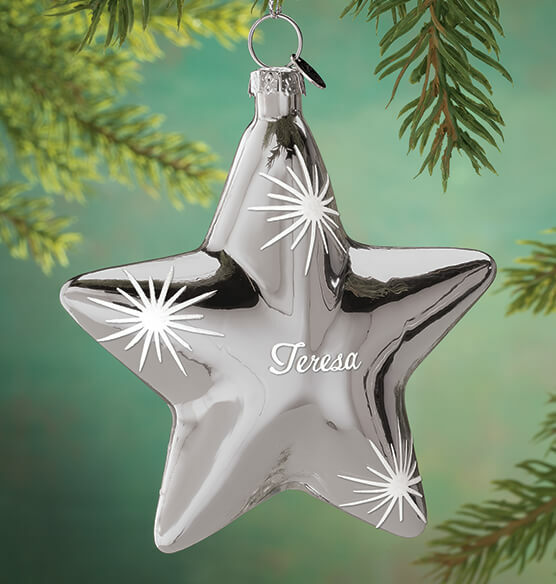 I bought three personalized star ornaments for my grandchildren. I was not expecting them to be this beautiful. The stars are very well packed and boxed and are attached with a lovely string hanger so they can immediately be placed on a Christmas tree. ( I have purchased other personalized ornaments that do not come with a hanger). The colors are magnificent, very brilliant. 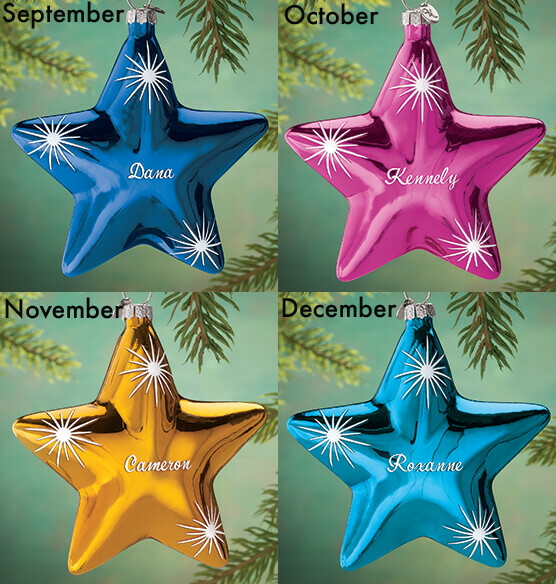 The stars can be used after the holiday season to brighten any child's room. Beautiful for adults as well. Every family member should have one of their own on the Christmas tree! Gave two to my adult daughters at Christmss. They loved the shape and personalized names. This birthstone ornament is unique and very pretty. I love that you can get it personalized with the person's name as a gift for the holidays. 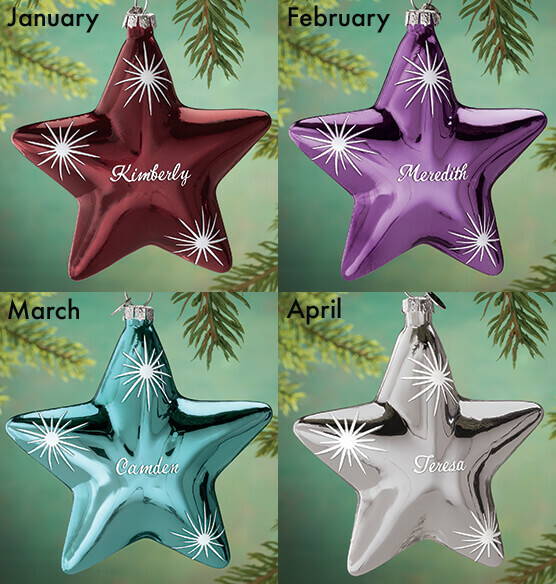 They have every birth month and they really can make a special gift for someone you love. the orrnament is very nice i just think the name could have been written in a larger font. I bought 5 of these and I thought they were just gorgeous! I gave them all for gifts! Have bought this product before and was very satisfied. Looks very nice in the Christmas tree. the wire where it is inserted into the star - the star of Kovey was chipped. took alot longer to get here than planned, otherwise was nice longer. It was a nice ornament but did not arrive in time for Christmas, was very disappointed. Very disappointed grandchildren when one of the points on their special star broke open. In neither case were the stars being handled roughly. if I place an order today, how long till it ships? BEST ANSWER: Thank you for your question. Personalized items take 6-10 business days to arrive. If you would like it by Christmas the order has to be placed using premium rate shipping. We hope this information will be of help to you.